England Under-19s will begin the defence of their European title in Finland this week without a number of star players. FA technical director Dan Ashworth has criticised the timing of the tournament, which clashes with clubs' pre-season tours. Manchester City's Phil Foden, Borussia Dortmund's Jadon Sancho and Fulham's Ryan Sessegnon are among those absent. Ashworth said Uefa's organisation was "bitterly disappointing". "This tournament is scheduled outside a Fifa window, which forces clubs to make such difficult decisions," said Ashworth. "We understand the dilemmas the clubs face around release of players during this particular time of the season and it's our view, and that of several other countries, that Uefa should take this into account when scheduling tournaments of this magnitude," he added. Ashworth believes the clash "impacts the value of the tournament" and hopes Uefa will schedule further tournaments "at a sensible time in the season". "We all want our teams to be facing the best players in the world to really provide the greatest developmental impact," he said. "That said, I am confident in the players that we have at this tournament and it gives them all a brilliant opportunity." It is understood Uefa did not want the tournament to clash with the World Cup. "The scheduling of youth tournaments is the subject of ongoing debate between Uefa and the national associations," Uefa said. 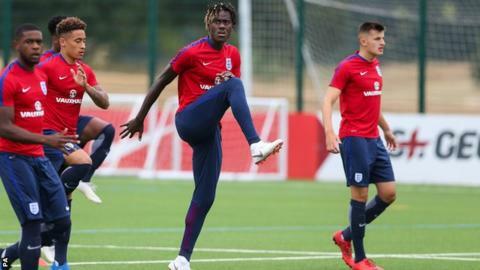 After topping their qualifying group, England open their Group B campaign against Turkey on Tuesday at the Seinajoki Stadium before facing Ukraine and France. The competition takes place from 16-29 July, with the top two nations from each group progressing to the semi-finals. In Group A, hosts Finland were drawn with Portugal, Norway and Italy. England beat Portugal 2-1 last year to be crowned champions, while their under-20s and under-17s won their respective World Cups during a hugely successful year for England's youth teams. The under-21s also made it to the semi-finals of the European Championships last year. Who is in England's squad? Chelsea defensive pair Trevoh Chalobah and Dujon Sterling and Nottingham Forest striker Ben Brereton were all part of last year's title-winning squad and are likely to be key figures again in Finland. There are three first-time call-ups - midfielders Tom Bayliss of Coventry City, Kelland Watts of Newcastle United and Max Sanders of Brighton. And there are returns for players such as Wolves striker Niall Ennis, Ipswich's Ben Morris and West Brom defender Nathan Ferguson, who have previously been capped at younger age groups. But England will have to fill the void left by the absence of 10 key players. Foden scored two goals in the Under-17s World Cup final and went on to make 10 appearances for Manchester City last season. He is taking part in City's pre-season tour. Sancho, who was another key figure in qualifying, is also absent because of club commitments. Arsenal trio Reiss Nelson, Joe Willock and Eddie Nketiah are unable to compete, and Chelsea's Mason Mount, Watford's Ben Wilmot and Barcelona's Marcus McGuane complete the list. The Young Lions will also miss Fulham star Ryan Sessegnon - the joint top goalscorer in last year's tournament - because he has made a step up to the under-21s after making his debut in March. How have last year's winners progressed? Sessegnon had a hugely successful season with Fulham, playing an integral part as they secured promotion to the Premier League. He was named the Championship Player of the Season, Young Player of the Season and Championship Apprentice of the Year at the EFL Awards. The 17-year-old scored 15 goals in 46 league appearances and became the first player outside the top flight to be nominated for the PFA Young Player of the Year award. Brereton signed a new deal to stay at Nottingham Forest until 2021 after making a name for himself in the first team squad and attracting attention from Premier League clubs. Chelsea youngster Mount signed a new contract before heading out on loan at Dutch side Vitesse Arnhem while team-mate Jay Dasilva made 38 appearances in League One during a successful loan spell at Charlton Athletic. Chalobah, who is expected to captain the squad in Finland, has been a mainstay in Chelsea's successful development squad. And Foden became the youngest Englishman to start a Champions League match in December and signed a new contract with Manchester City. England's World Cup performances weren't being taken in isolation when it came to assessing the state of the nation's football improvement. The positivity generated by outstanding results at youth team level - two World Cup successes and a European Championship win - offered tangible proof that FA technical director Ashworth and his team are getting it right. Yet Ashworth is furious that this is potentially being undermined by the timing of competitions. England must reach the semi-finals of this month's Under-19 European Championships to qualify for next year's Under-20 World Cup. They will have to do it without most of their best players who, in a World Cup year, are needed to fill gaps at first-team level for lucrative tours the major clubs are committed to. It is unreasonable to expect players or clubs to put England first right in the heart of pre-season. But if England pay the price in Finland, there will be an adverse spin-off next year as well.